China is reducing the import tax on donkey skins for use in traditional medicine despite fears over a global reduction in the animal's population. From Monday, the tax will fall from 5% to 2%, making imports cheaper. Gelatine made from donkey skin is highly prized in China and purchases of hides have soared in recent years. Campaigners say this has led to a reduction in donkey numbers in countries across Africa, where they are widely used for work and transport. The surge in demand for imports comes after China's own population of the animals has more than halved since 1990, according to government figures. In many African countries, there is already a shortage of the animals due to the increasing demand. In China the skins are soaked and stewed to make gelatine, which is used to treat ailments such as anaemia. Donkey meat is also a popular food, but a huge drop in the number of Chinese donkeys and the fact that they are slow to reproduce, has forced suppliers to look elsewhere. 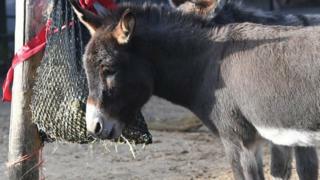 As a result campaigners have called for a total ban on the export of donkey hides to China.